Wits FC look to bounce back after winning 2-0 against CUT. Wits University’s Varsity Football team (WitsFC) redeemed themselves with a victory at home as they humbled Central University of Technology (CUT) 2-0 on Thursday, August 11 at the Bidvest Stadium. Wits came to this encounter having conceded 10 goals in their previous two matches of the season, while CUT have enjoyed a perfect start to the season winning both their opening two games. Although Wits FC went into the game occupying the ninth place on the log, they were ready to cause an upset, the favourites CUT who were second in the standings. Wits FC was in top form, as they started the game off like a house on fire and took the lead through a corner kick within the first two minutes of the game. Wits centre defender Phuti Leboho headed the ball past a well beaten CUT goalkeeper who could do nothing but pick the ball from the back of his net. Wits FC held a very high line in their defence while maintaining a very high attacking game. Ten minutes later Wits FC play-maker Mahle Mtabane broke free from his marker and had an attempt at goal, only to see his effort sail over the crossbar. The first yellow card of the evening was given to Wits FC Luke Pareira for fouling CUT’s Tsietsi Ramosedi. Sello Mokhele stepped up to take the resultant free kick, which didn’t even test the Wits goalkeeper who had little to do in the first half. In the 28th minute Wits FC were at it again, scoring another goal this time from the penalty spot. Luke Pareira slotted the penalty kick after a CUT player was adjudged to have handled the ball in the penalty box. Wits FC almost threw away their advantage as 10 minutes into the second half their playmaker Mtabane fouled CUT’s Neo Sebudi and was handed a straight red card for the extent of the tackle. With a one man advantage, CUT started throwing numbers in attack, a strategy that almost worked with Abrahm Singozo narrowly missing a goal after some brilliant quick passing gave the CUT man a clear shot on goal. But their efforts went to waste by the time the referee blew the whistle, calling it a game. 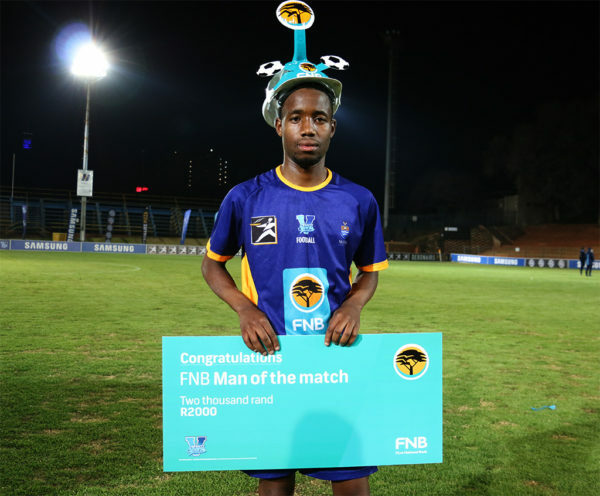 FNB Man of the match was no other than Wits FC’s 18 year old fourth year LLB student, Saluleko Mathonsi, who put in a stellar performance as he assisted in setting up the two goals for this team. “The next game is not going to be easy but we [Wits FC] came here [the tournament] to win not to entertain,” said Mathonsi. Wits FC’s game proved their determination to win the tournament and the fans expectations have risen as they face off local Johannesburg rivals, UJ next Thursday, August 17.